Will you remember what’s on your hard drive in September? We are at that time of year when many schools are already off and New York is just finishing. I’ve spent time between exams taking down the classroom decorations, removing bulletin board backing, saving borders, and filing things away for next year. It dawned on me that we are coached and encouraged to “summerize” our classrooms but not our hard drives. I mean, all that data isn’t going to get dusty. If you’re like me however your brain gets dusty over the summer and that file labeled “meeting.doc” that you were sure you would remember gets forgotten. Yes, we could just open it up but to do that we have to mouse over to it, click rapidly twice and wait. Too many steps just to discover it may not be important at all and in the new school year you have many other important things to put energy into. Label folders and files clearly. It should be clear to anyone else where to find things. Have a colleague take a look for you and see if they can easily identify where things are. Group similar folders in a single folder. It can be overwhelming to have to scroll through files and folders to find what you need. Creating an effective nested structure can help make things easily accessible. Use school years on folders with dated materials. Grades and student work align to particular years. It's best to keep the work in folders dated by year for reference. Backup hard drives. Hard drives fail and we cry. Creating physical copies of important files or moving things to the cloud can save you from having to rewrite all those lessons. Copy cloud folders. I like to have all the materials I developed in my personal account as a backup. Use Google Takeout or Gsuitetips Copy Folder to move your personal digital resources. Color code and emojize your folders. While this can add a bit of levity to what you are doing it also makes things very easy to find at a glance. It's also a fun trick to show students. Just as you would clean up a classroom, stow and secure all your digital resources. Clearly label folders. Even if there’s many of them. Consider grouping folders in other folders. 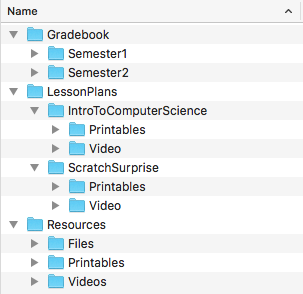 I do courses then each course gets a folder within for resources, lesson plans, gradebook and so on. I break my resources into printable (rare in the digital age), videos, files. I also keep duplicates within the individual lesson folder. Inevitably I’ll remember the resource but not the lesson I used it with. Check the mysterious files. I’m one of those who opens a new blank document to show off some feature and then gets pulled into something else so the document gets closed and saved with an untitled name and garbage information in it. If I remember I’ll delete it later but they do slip by me. I found over a dozen in this year’s drive to clean. Force yourself to check each file you may not recognize. If you can, get rid of it. You save yourself some confusion later. Back up everything. Google, OneDrive, iCloud, Box, Dropbox are amazing places to keep your data. It does happen that passwords get forgotten and accounts get locked for various reasons. Hard drives do fail and data becomes unrecoverable. You may have a backup system running but it’s still important to put files in a place you feel in control of. Use a spare USB drive, External Hard drive, or an online cloud storage. If you are keeping files in Google drive on your school's domain you can take a copy of all your files with you. Use Google Takeout to download a zip. Or to keep the google file type share a folder from your personal account to your school account. Put all the documents and folders you want backed up from the school account in the shared folder. 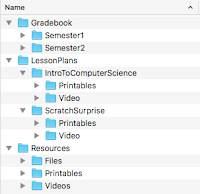 From your non-school account sign in and use Gsuitetips Copy Folder and follow the steps to make a copy and retain the folder and file structure.